Alright, I know that it's Sunday but we've missed our regular posts this weekend so I thought I'd share a vegetarian dish today, for our vegetarian followers. I am what you'd call a 'disgruntled vegetarian/vegan' in that I don't mind meat but it doesn't like me very much. But it's very important to ensure to get all the appropriate intake of protein, iron and other vitamins that you may miss from not consuming meat. If you find the right recipes, you'll be amazed to find out how you can create dishes that actually either taste like meat, or don't make you miss it as much. This was one of them for me. I've had to alter this recipe slightly, simply because we are a nut-free home and there are peanuts included. I will include my alterations for fellow nut-free families out there, which are bolded. ~ Place onion, garlic, chilli pepper and lemongrass in a food processor and grind to a puree, or pound the ingredients using a mortar and pestle. 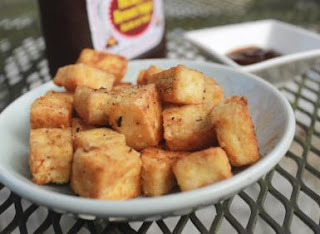 ~ Once tofu is ready, fry half of the spice paste in another pan until the aromas are released. After a few minutes, stir in the lemon juice, and then the blocks of tofu. ~ Sprinkle the green onion, then your soy sauce. Allow to cool to room temperature. ~ Heat 1 tbsp of oil in your pan, then add the rest of the spice paste. Add your sugar and 1/2 cup of water. Bring to a boil and stir in the peanuts (usually at this point I add in my peabutter instead of the peanuts). Heat gently until the sauce thickens. ~ Either add the tofu mixture with the peanut sauce as a dish on it's own, or mix the tofu in with the sauce and serve with rice or noodles.